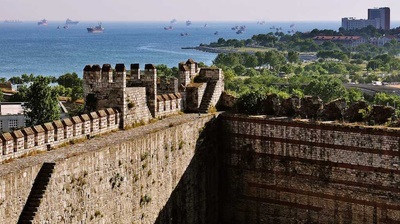 The amazing Yedikule Fortress has witnessed many events and political disturbances in history. Located on the coast road leaning to Bakırkoy from Sarayburnu, that great structure was built as an entrance door of the city ‘’Constantinople (todays Istanbul) ’’ for Byzantine Emperors. At the beginning, that glorious entry door, also called golden door was established by Byzantine Emperor Theodosius I to be used as a triumphal arch in 412. During the reign of Theodosius II, two towers were added on both sides of the door and it combined with the city walls. Afterwards, in the period of Byzantine Emperor Kantakuzen IV, other two towers were added again next to those towers. Once upon a time, opened to the biggest street in the city, that fascinating golden door met magnificently not only the Emperors gaining a victory from the war but also the eligible people, which looks like a Red Carpet welcoming Hollywood stars. Additionally, because it was ornamented with golden gilts and silver leafs, that famous door was named Gilded Door except for Golden Door. In time, another smaller golden door was erected between ditch and walls around that gilded door in order to defence the city against the any attacks. Also it was surrogated with the sculptures belonging to Goddess of the Victory and Byzantine Eagle but they could not stand today. 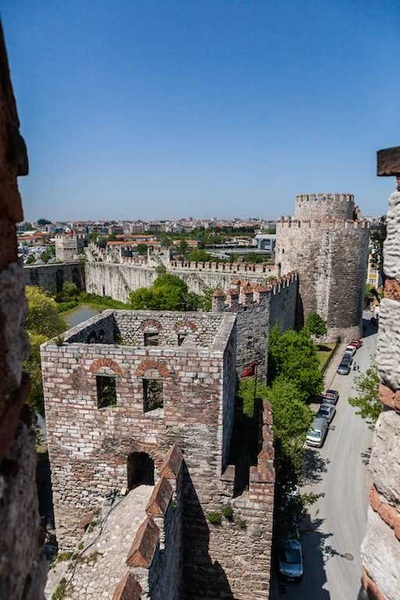 After the conquest of Istanbul, Ottoman Sultan Mehmet II, the Conqueror turned the city walls with four towers into a closed fortress by adding three different towers. Since then it was named as Yedikule Fortress (Fortress of the Seven Towers) which is a production of Ottoman-Byzantines. Today it is an admirable museum. Except for the history, used for various purposes, functions, Yedikule Fortress has many attractive features with interesting events. Firstly, that amiable structure was used as Treasure Building in Ottoman Period; Resembling pentagram shape, this fortress was a place where the first Ottoman State Treasury (Hazine-I Humayun) and the Booties were kept here between 1458 and 1789 years. Secondly, It also used as a prison; many famous people such as Çandarlı Halil Pasha, grand vizier Ferhat Pasha, Mahmut Pasha, Krym Khan Mehmet Giray, Georgian King Simon, Trebizon-Rum Emperor Comnenos, Maltha Knights and Ottoman Sultan Young Osman were imprisoned, tortured and executed here. 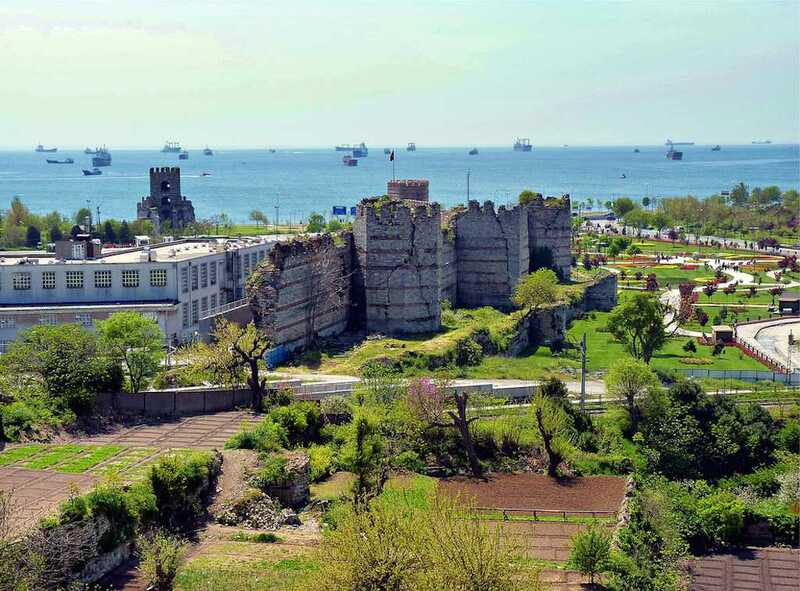 Thirdly, the magnificent Fortress was damaged due to Big Istanbul Earthquake in Sultan Mahmut II time but renovated again. Moreover, Sultan Abdulaziz established here the Girls School of Art where 400 girls were educated for 4 years, while during the reign of Sultan Abdulmecit, brother of him, it was used as the zoo. Lastly, in 1895 being under the control of Museums General Directorate, Yedikule Fortress has belonged to the Fortress Museum Directorate since 1968. There was an enormous boiler filled with the nails in order to persecution the guilty people within that room. The people were executed in that scary caldron. Therefore it was called Torture Chamber (Room). There is a well dating back from Byzantine Era. Once upon a time, when the guilty people were executed, their cutting heads were thrown to that awesome well. As a result, those heads created the bloody scenery. Therefore the well takes its name from that bloody sight. Because of that at one time, Ottoman Sultan Osman II (called also Young Osman) was slaughtered in that part, it was well known as Young Osman Tower. Also many guilty people were executed within that section. When you step into the tower, you see that there are found many torture instruments, wheel and stake which symbolize that part as a death and torture of tower. Additionally, the walls of that section attract the visitors because there are found many names in Ottoman Turkish belonging to prisoners were carved with their bloody nails on those walls. It is located across Young Osman II Tower, on the north of Golden Door. At the beginning used as the armory, this tower was also worked as dungeon in the period of Ottoman and Byzantine. 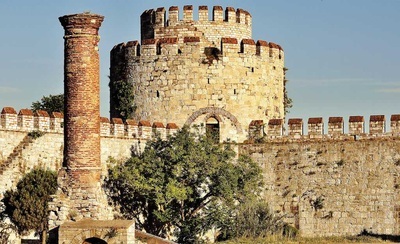 Called firstly Pastroma Tower in Byzantine Time, that charming structure was named Ahmet after the rebuilding with octagonal shape by Ottoman Sultan Ahmet III in 18th century because it was demolished due to an earthquake. Because of that it was popularly known that Ahmet Tower. 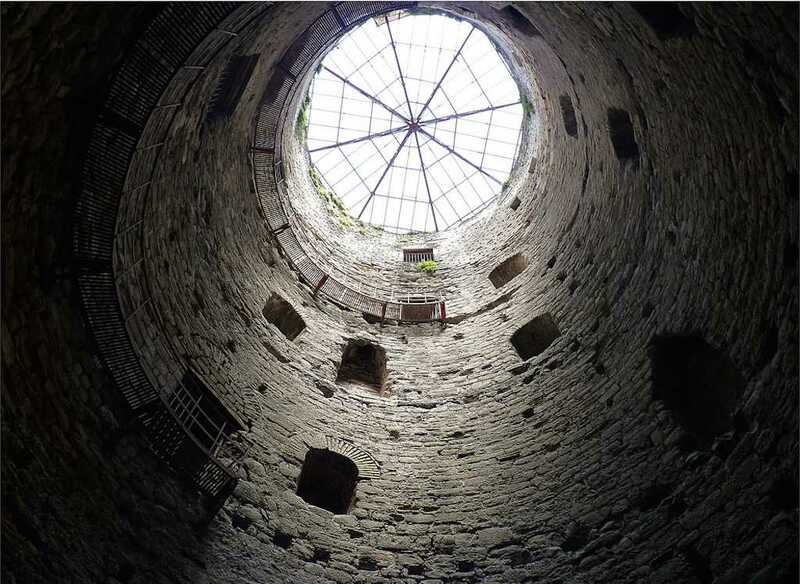 After the conquest of Istanbul, that section was begun to be used as the first treasure chamber by Ottoman Empire. Within that time, all gold, silver, jewel and the other precious stuffs were kept in here. It is one of two towers used as dungeon. That part was assigned for the noble people; the kings, princes and viziers were imprisoned within that section. Being nearest tower to Marmara Sea, the watch tower was built in order to protect the city from any attacks coming from the sea.